In response to your requests, we have introduced online dietetics. It’s a good solution for people who want to use our services but live in another city or country. Online dietetics has been successfully used by patients from Pomerania, Kielce, Cracow as well as the United Kingdom, Denmark or even the Arab Emirates. In online dietetics, preparation for the appointment looks exactly the same as the one for the office. We need to collect exactly the same information to get familiar with your health status, expectations, goals and create a dietary plan. The ideal solution is to have your first appointment in person at our office, with Dr. Olga Paluchowska or Daria Sitko–Walczak, as it facilitates the proper collection of necessary information and helps to get to know the patient better. Once it’s not possible, we will conduct the first online appointment in such a way as to succeed without your presence. Online dietetics is as effective as regular appointments at the office, but it requires greater self-discipline on patient’s side, especially in terms of body weight check and anthropometric measurements. 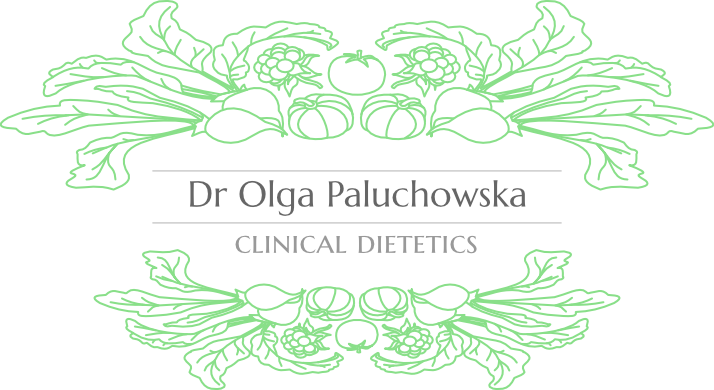 An online dietitian in the Dietetic Office of Dr Olga Paluchowska is Daria Sitko–Walczak conducting email or skype consultations. The cost of online dietetics is the same as for the appointments in the office.